Congratulations to the winners of this year’s National Skipping Challenge. This week we presented the Challenge Cups to the Individual Winner and the Team Winners. 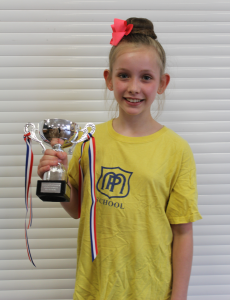 Our individual winner of the National Skipping Challenge 2015/16 is Sophie Froggatt, from Malden Parochial Primary School in Worcester Park, Surrey. 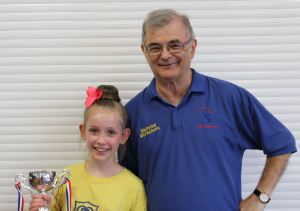 Sophie proved to be an outstanding all-round skipper, managing to finish the year with Top 3 scores in four of the five National Skipping Challenge individual skipping categories. Sophie managed 565 crossovers as well as 415 jumps in double dutch and 125 in pretzels. Malden Parochial Primary from Worcester Park had a lot to celebrate this year. 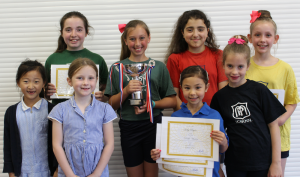 Due to Sophie’s efforts and a number of others in the Malden Parochial skipping team, they also managed to win this year’s Team Cup for winning School of the Year. Congratulations to all members of the Malden Parochial Primary Skipping Team! Congratulations are also in order to this year’s runners up! Last year’s winning school, St John’s Primary in Kingston-upon-Thames, came second this year, after another outstanding year of skipping. In third place was Manor Park Primary from Douglas in the Isle of Man, proving that not all of the best skipping comes from mainland UK! We hope that everyone who took part in this year’s National Skipping Challenge had great fun, learnt new skips, and will continue skipping and improving next year!